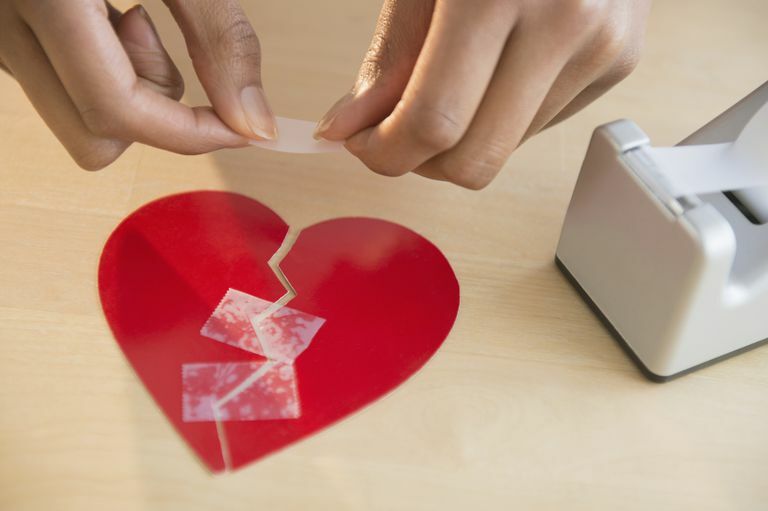 How can you heal your broken heart when a relationship goes sour? The pain of an ended relationship is one of those universal experiences that we all share. The movies and many novels make it seem relatively easy. Either people get back together or they each find something better in their future. Unfortunately, real life broken relationships don't come to a resolution in two hours as they often do on the silver screen. We won't offer any platitudes about your feelings at this time. Overused adages such as "it is better to have loved and lost than never to have loved at all' might make the person offering the advice feel better, but doesn't really help your heart to mend. We won't offer a quick fix. Healing is hard and nobody can tell you how long it will take. There's no easy way to get through it, but hopefully these steps can help as your heart continues to bleed. It's okay to grieve for a time. Seek support from your friends and family as you come to terms with the changes in your life. Don't look at past relationships as failures, but rather as opportunities to learn and improve your relationship skills. This applies whether you are 15 or 55. We can all learn. Don't worry that you're not in a relationship. Your value comes from who you are, not who you're with. Repeat this to yourself a few times. Let it sink in. You don't have to be a recluse just because you aren't a couple. Treat yourself to an evening out doing something you enjoy. Take along a friend if it's not a solo activity. Treat yourself to a special gift now and then. You are a special person and you deserve it. There's more to life than romantic love. Take this opportunity to nurture your friends, family, and yourself. Take some time to reevaluate what you need in a relationship. Have you been choosing partners who are not capable of a loving and mature relationship? Were you hoping that your loved one would change? It can be painful to admit to yourself that you need something that wasn't available in your previous relationship. Yet doing so frees you to look for those exact qualities in the future. Be willing to take another chance on love. Like they say, you can't win if you don't play. Sadder than losing someone you love deeply, is choosing someone you don't love to that depth out of fear of feeling this hurt again. Be a friend to yourself. If you care about yourself, the odds are better you will attract those you care about you too. Read this one a few times as well. Commit it to memory. If you're finding it hard to let go of a relationship, you may need to seek counseling. An obsessive need to be with someone who no longer wants a relationship may be a sign of love addiction. Avoid jumping into a rebound relationship. Take some time to work through all the issues from your previous one. Don't try to get revenge. This will only slow your progress in healing from the hurt. Forgive yourself. You can't change the past, but you can learn from your mistakes and not repeat them. Forgive your partner. This doesn't mean that you are saying what happened is okay. What it means is cutting your losses and not investing any more time or energy in something that hurts you. Church groups, volunteer activities, and university lectures are just a few ideas for meeting new people in a safe environment. Get a makeover, join a gym, or start a diet. As you improve your health and appearance, your self-esteem will rise. Rumination: Why Do People Obsess Over Things?